How do I mount my camera to the Questar? Any camera with a 1.25" diameter eyepiece adapter can be mounted on the Questar just as you would on any other telescope. You only need the latest eyepiece diopter adapter with thumb screws that supports a standard slip fit eyepiece. A much better approach is to use the axial port at the rear of the control box. This allows easy switching between visual observation and photography without disturbing the camera mounting. A screwed together camera adapter provides a more stable attachment than a slip fit eyepiece adapter. When you mount a camera and auxiliary lenses on the Questar you have parts with multiple diameters that screw together using multiple thread standards. See Questar Camera Adapter Screw Threads for help in keeping these straight. 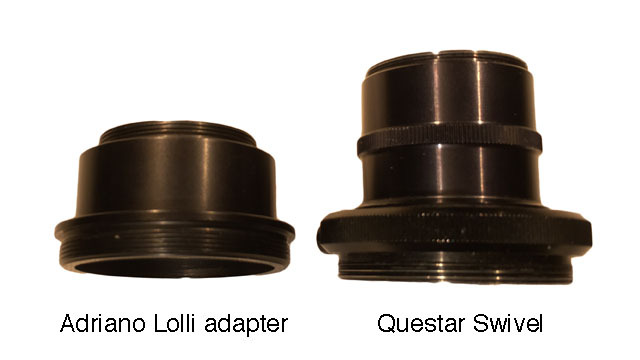 Questar supplies M42 P-thread (42 x 1.0 mm) adapters for different cameras. Your camera may use either a screw mount (usually older cameras or small video cameras) or a bayonet mount (common on new DSLR or mirrorless cameras). 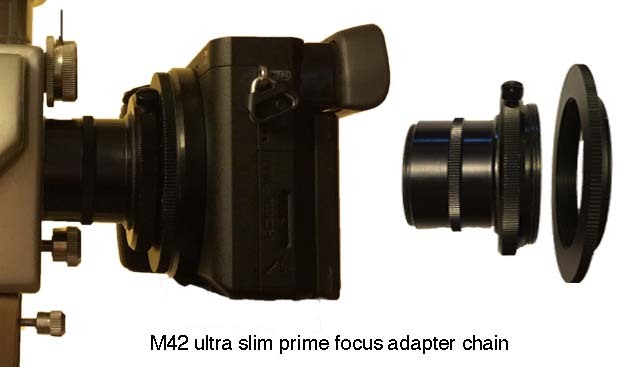 For Sony E-Mount cameras, eBay has been a good source of high quality M42 (P thread) to NEX slim adapters intended to work with helicoid focusers that work well with the Questar. Sources of 3rd party M42 x 1mm (P-thread) adapters include: eBay, Amazon, Adorama, B&H Photo and your local camera store. 42mm T-tread (42 x 0.75mm) adapters are very common and easily cross threaded with the Questar P-thread adapters. They are commonly available for telescopes and cameras. If your camera adapter uses the newer 42 x 0.75 mm T-thread, you will need an adapter from Questar's M42 x 1.0 mm P thread to the T thread in order to use any of Questar's couplers. Questar's "P" to "T" adapter (part 19354) does this job. I've found telescopeadapters.com to be a good source of high quality 42mm T-threaded adapters of many kinds. 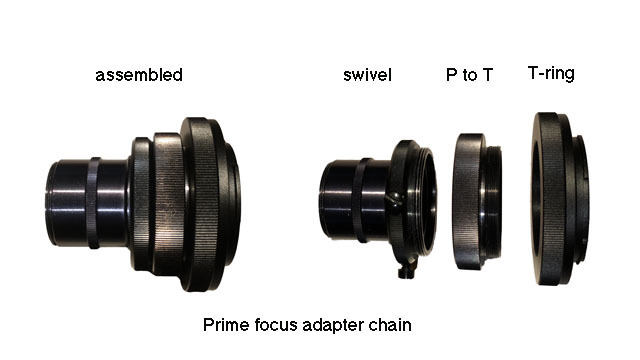 They sell two lengths of T-ring adapters for mirrorless cameras: one that matches the standard camera lens flange distance of a DSLR and a "short" version. The longer adapter is needed to achieve infinity focus when used with a T-mount camera lens in a mirrorless camera. The long adapter isn't needed for a telescope and there are significant advantages to keeping the adapter chain short. For a telescope you want the short version which brings the camera closer to the normal eyepiece focus (less back focus distance required). It is possible to make the eyepiece and the camera focus at the same setting, by adding an eyepiece tube extension and a parfocal ring to the eyepiece. A shorter adapter chain also makes a camera easier to balance on a small telescope like the Questar. High quality M42 (P-tread) based Ultra Slim camera adapters for Helicoid Tubes have become available at very low cost via eBay. These adapters are available in 1mm and 3mm thicknesses. I find the grip the 3mm gives easier to use. These trim about 2cm off of the adapter chain length compared to using the P to T tread adapter and a T-ring. You need an adapter from the axial port of the Questar to the 42mm T-thread of your camera adapter. The Questar swivel coupling (part 13071 if you have a recent Questar) does this job and also provides a thumb screw locking swivel adapter that allows your camera to be rotated to adjust the framing of your image. Questar also makes a swivel coupling adapter for older Questars with the 0.925' axial port (this part 19304 may be incorrectly described as 0.95"). You now have everything that you need to take prime focus images with your Questar as the lens for your camera. 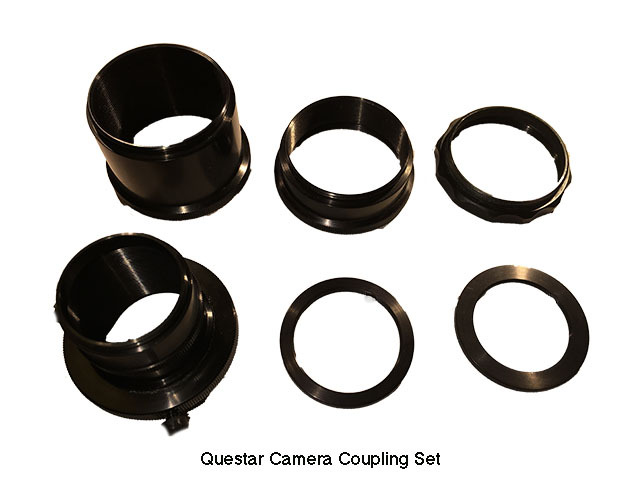 Questar also provides the swivel adapter in the camera coupling set, a package that gives much more flexibility in the magnification of the images that you take. Camera Coupling Set (part 13075) which includes the swivel coupling (part 13071) and the extension tube set (part 13073). The extension tube set adds 5 parts: 3 extension tubes (1", 0.5", and 0.25") and two internal rings (one threaded for the Questar/Brandon eyepieces) and one threaded for the Questar/Brandon Barlow lenses. If your Questar does not have the circa 1964 wide field modification, you will need a special version of the swivel coupling that fits the old small 0.925" 32TPI axial port (this part 19304 may be incorrectly described as 0.95"). Always verify correct part numbers with Questar. These additional parts allow you to use either eyepiece projection or Barlow lenses to increase your effective focal length and magnification. This is necessary for detailed planetary images. 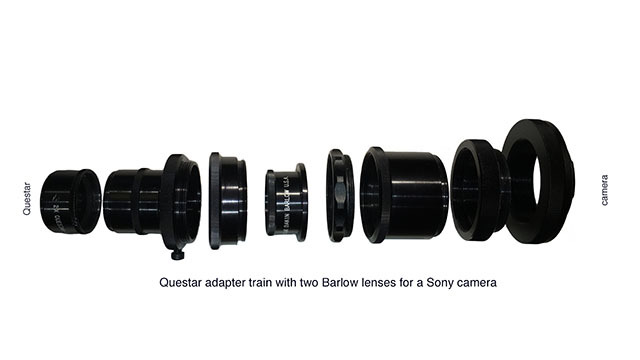 The Questar focal reducer lenses use the same thread as the Barlow lenses and the rear axial port of the Questar. Focal reducers should be placed there to get the maximum 1.2 degree FOV of the Questar. 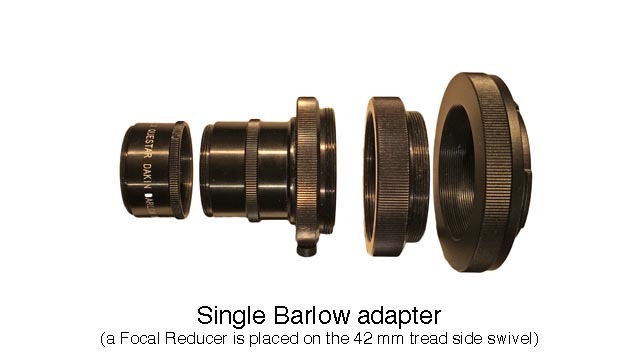 Barlow lenses can be placed either between the axial port and the swivel adapter or via one of the internal rings in the extension tube set, between the swivel adapter and the camera. It is possible to stack Barlows by placing them in both locations. 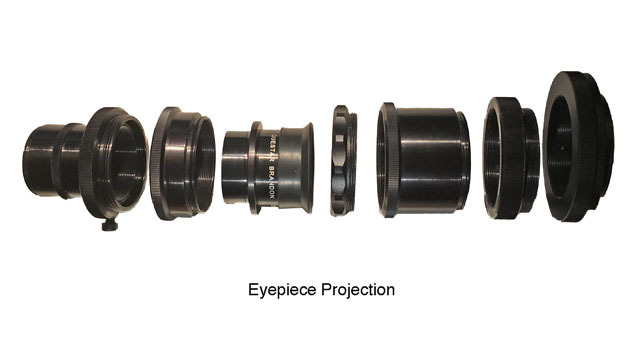 Eyepiece projection using the Questar Brandon eyepieces is very similar to placing a Barlow after the swivel adapter. The Questar eyepieces have threads on the outside of their barrel that will thread into the ring with the larger center hole in the camera coupling set. The Questar has a great range of focus, so there is seldom a problem achieving focus no matter what combination of optical attachments you use. Keeping the optical train short minimizes balance problems. The Questar control box makes it easy to switch back and forth between the top port eyepiece view and axial port camera. If you use an eyepiece tube extension and parfocal ring you can avoid the need to refocus when you switch between the camera and eyepiece view. When the eyepiece is in focus without a tube extension, the axial camera focus is at the immediate rear of the control box. The offset between the camera and eyepiece focus is minimized by placing a Barlow lens near the control box, before the swivel adapter. For prime focusing, the closer the camera sensor is to the back of the Questar the easier it is to match up the visual eyepiece and camera focus. The Astromania M48x0.75/M42X1 Female to M42X0.75 Male Telescope Adapter is a good substitute for the Questar P to T tread adapter at about half the price. The M48 outer thread functions as a knurled grip for the M42 female P to M42 male T tread function. I found it available on Amazon and eBay. An Italian company, Adriano Lolli Construzioni Ottiche Meccaniche, sells Questar axial port to T ring adapter (they have an eBay based store). This adapter can be used in place of the Questar swivel adapter and the P to T thread adapter. It is probably most useful with DSLRs. With mirrorless cameras, the camera can be so close to the back of the Questar, that the focus knob can't be unscrewed enough to come to focus at infinity. You give up the swivel function, but that can be provided by a T2 style, camera T ring adapter with adjustable rotation. A short adapter chain brings the camera focus adjustment closer to the eyepiece focus point, making it easier to switch between visual observing and photography. Making the visual focus and camera focus adjustments the same or very close is very helpful with dim DSOs, when it may be very difficult to find camera focus. A shorter adapter, like the Lolli, does limit how far the focus knob can be adjusted out from the camera. I had no problem bringing my Sony E-mount camera to focus at infinity at prime focus using the P-to-T adapter and a T-ring. If your camera mount T-ring is very thin, you may not be able to reach infinity focus with a short adapter and a mirrorless camera. The Lolli adapter also screws a bit further in to the control box than the Questar swivel adapter, intruding slightly into the interior. I know of at least one Questar where this interferes with the internal Barlow lever. The Vernonscope 1.25" Filter Adapter (to fit foreign filters to Brandon eyepieces) will allow 3rd party Barlow lenses designed with standard 1.25" eyepiece filter threads to be used with the Questar filter threaded internal ring in Questar extension tube set. It can also allow a standard eyepiece tube extension to be added to a Questar eyepiece to make it "parfocal" with a camera on the axial port. If you need to use standard slip fit 1.25" eyepieces for eyepiece projection, there are 3rd party 42mm T-threaded extension tube/eyepiece projection sets available. If you find it difficult to locate the adapters that you need, a custom adapter is an alternative. A local machine shop may be able to make what you need. PreciseParts Build-An-Adapter will make custom adapters that will go directly from the Questar axial port or P-thread extension tubes to many kinds of equipment. I've done my best to get all the vendor and part information correct. However, be sure to double check before making a purchase. For example Sony made a subtle change to their E-mounts in their latest cameras, with the result that some older tight adapters no longer work. I've seen variations in different age Questar extension tubes result in surprising incompatibilities or seeming compatibility. Some parts have only a few threads and a mismatched part will sometimes screw on smoothly. However, the thread pitch is wrong and the joint is weak because thread contact is in only a small area. 2016-06-30 Added more info on E-mount adapters and clarified M42 P and 42mm T thread wording. 2016-08-11 Added M42 Ultra Slim adapter illustration and info on making eyepiece and camera focus together. 2016-09-13 Added more info on issues with the Lolli adapter and clarified wording. 2018-08-23 Added info on Astromania P to T tread substitute and PreciseParts Build-An-Adapter link.